For all of the left's bluster over selectively edited videos from citizen journalists, progressives do not seem to mind spreading misinformation from public servants such as Sen. Kamala Harris (D-CA). In fact, Harris and her cabal are not simply showing a selectively edited video, but a deceptively edited video regarding a potential Supreme Court associate justice. In other words, they are willingly promoting a lie. During Brett Kavanaugh's Supreme Court confirmation hearings, the California Democrat and potential 2020 presidential hopeful asked President Trump's nominee a question about a recent case regarding religious objections to abortion and contraceptives. Kavanaugh answered, but Sen. Harris opted to tweet out only a portion of his response which made it look as if he was calling "contraceptives" an "abortion-inducing drug." As others have already noted, the video is deceptively edited to start mid-sentence. What Kavanaugh actually said was: “It was a technical matter of filling out a form in that case. But they said filling out the form would make them complicit in the provision of the abortion-inducing drugs that they were, as a religious matter, objected to." [Emphasis added]. The “they said” in that sentence refers to the Catholic plaintiffs, Priests for Life. Kavanaugh was describing their views, not his own as a judge. And his description was accurate. So the attack on Kavanaugh is baseless—and deeply dishonest. Case closed. You will note that Sen. Harris' tweet has amassed thousands of retweets and favorites. It is now being broadcast via other media outlets and organizations to the masses. It is a lie. It is quite literally "fake news." The clip was edited to deceive the American people. Not only is this tweet a lie, but it shows the left's hypocrisy. 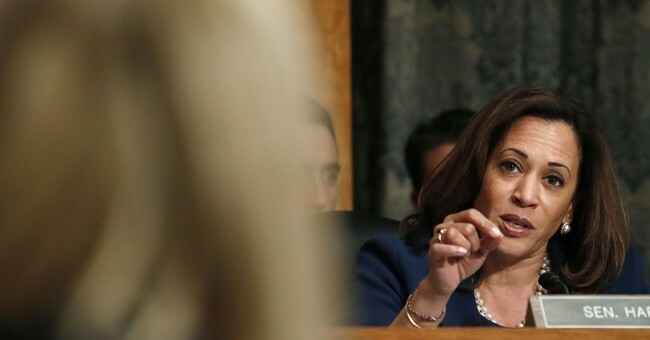 Readers should remember Sen. Harris is the same politician who used her office as Attorney General to raid citizen journalist David Daleiden's home in wake of his devastating undercover Planned Parenthood videos. Those tapes allegedly showed abortion providers discussing how to harvest human tissue that could later be sold and trafficked. In the videos, Dr. Deborah Nucatola explained "how to 'crush' the unborn baby to harvest his or her organs intact. Several others expose the extensive revenue that Planned Parenthood receives from the trafficking the body parts." Daleiden has been dealing with an ongoing lawsuit ever since. Liberal critics harangued Daldean's group, Center for Medical progress, for what they claimed were deceptively edited videos. Based on all the available footage, Daleiden did nothing of the sort. Like Daleiden, Project Veritas' James O'Keefe has also been dogged by accusations of deceptively edited videos his entire career due to his various sting operations using undercover recordings. "These videos are not the full footage, these conservatives select only what they want to show," their critics argue. But every news organization in the world uses selectively edited videos. What the left purposefully ignores is that there is a huge difference between "selectively" edited videos and "deceptively" edited videos. The left attempts to confuse viewers by using the term "selective" in a disparaging manner, hinting that the video is somehow not true. But further examination of the footage put forth by Project Veritas or the Center for Medical Progress shows that the remarks are in context. Yet, faced with overwhelming evidence that Sen. Harris indeed deceptively edited Kavanaugh's remarks, Democrats are suddenly silent on this subject. This incident further proves the far left does not actually care about the truth. They do not care about principles. They simply care about advancing their agenda. So if they have to slander a journalist like Daleiden or O'Keefe to keep the truth from America, they will do it. If they have to partake in the very same activity they accused the aforementioned journalists of, then they have no problem doing that either. Their duplicity on this subject is a danger to America.